$1,000 range solid states and push pulls (from ADCOM, Acurus, Carver, Jolida, SF TPC Assemblage). Also heard AudioNote amps at length. Very good product walking to excellence.In his category unbeatable champion.A great amplifier from a excellent builder with a promissory future(Steve Deckert).Only with a man use his intuition can produce something like that.I'm a proud owner of this exquisite product(SV83M's),without exaggeration is in truth extraordinary.Incredible bass for a single ended triode(very rare),very detailled,clear like crystal,and...sorry I can't find the appropriate word to describe his fabulous midrange and amazing soundstage.A REAL WINNER.¡Believe it! Thanks to Steve Deckert to teach me about a real true ¡LESS is MORE! But,like nothing is perfect,a little amplifier(¡A GIANT KILLER! )made in Peoria,Il. by a little company without financial resources to open the doors of the big bussines of High End Empire,saddly for the fans of this activity.At the end,this language(english),is not my native language,sorry for my possible grammar mistakes. Require higher than 90 dB speakers to sound best. As a revealing component, you might have to re-evaluate other components in your system. For more detailed and complete reviews, please refer to the stereo version SV84C and SV84CS (select version) else where in this site. They sound reportedly the same as these monoblocks, just having a bit less power. I bought the most recent SV83M monoblocks from Steve's High Fidelity Engineering (a.k.a. Decware ZEN), and this is the 3rd weekend I have them. I feel they are still breaking in, and most other veteran users said they keep improving after months of listening. 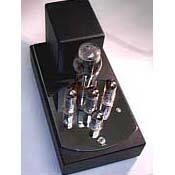 Even driving the 86 dB Magnepan MMG, the SV83Ms show a musical purity that is very satifying. Like most SET the SV83Ms have liquid midrange and sweet highs. Unlike many other SET amps, the SV83Ms' bass is tight, articulate, and realistic; their highs are extended. Their overall music representation is always faithfully precise, wonderfully musical when the recording calls for. These amps are damn fast; the starts and stops of musical passages can be startling. Listening to the SV83Ms and MMG at night and low/modest level is a treat: The music is so good I don't feel missing too much bass. As always, I can add a subwoofer whenever I like, but I prefer sans-sub except for movies. A follow-up with more details reviews will be submitted once I get the 93 dB HornShoppe from Ed, www.thehornshoppe.com. The speaker will need a couple weeks for break-in. CAL Delta --> Illuminati D-60 --> Meridian 518 --> Illuminati D-60 --> CAL Alpha with RAM LABs 12AX7 tubes --> KCAG --> SV83Ms --> Monocle XL --> MMG. All sources and an SV83M plugged in a PS Audio P300. The other SV83M plugged in a PAC IDOS. A number of XRCDs from FIM. Diana Krall, Patricia Barber, Holy Cole, etc. None. This is my first experience with single-ended triodes. Did listen to Rogue Audio 120w monoblocks at a local dealer.